The San Francisco Bay Area is a biodiversity hotspot, supporting an enormous number of species, including a large insect fauna with many endemic and threatened species. The health of ecosystems is largely dependent on smaller, often overlooked organisms, such as invertebrates, plants, and microbes. Bees, by virtue of being pollinators, are important, integrated components of natural ecosystems; thus, they should be good indicators of the ecological health of an area. The Presidio is a large open space in the city of San Francisco where land has been greatly altered by humans. Currently, many areas in the Presidio are being restored to their native coastal habitat. During this restoration period, old army landfills are being dug up and removed and the land area is then refilled with soil and replanted with native plants. Researchers from San Francisco State University (SFSU), led by Dr. John Hafernik and graduate students Hannah Wood and Vicki Moore, investigated bee diversity from nine sites around the Presidio encompassing natural areas, unrestored disturbed areas, and a forest site. Undergraduate entomology students from SFSU, using pan traps and insect nets, assisted in sampling each site at least once a month from March through October. Back on the SFSU campus, graduate student Cynthia Fenter identified the bees. Fenter is continuing to investigate bee diversity in San Francisco Natural Areas for her Masters thesis research. 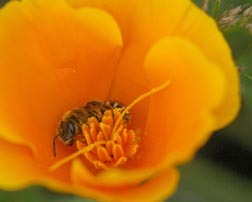 The SFSU researchers found a rich diversity of bees in the Presidio, including 56 species representing 23 genera. All of these species, except for the honeybee, are native to the San Francisco Bay Region. Thus, despite its long history of habitat disturbance and negative effects of urbanization, the Presidio is still home to an impressive number of native bees. This bodes well for successful establishment of native plants in restoration sites. Of the nine sites sampled, one site, a small fragment of native land, supported the greatest number of bee species (35). This site has never been highly disturbed nor restored, although it does contain some patches of invasive plants. At the other end of the ecological spectrum, the researchers also found a considerable number of bees in a highly disturbed area on an old army landfill. Bees were especially abundant when the non-native plants on the site were in heavy bloom. This suggests that non-native plants in the Presidio serve as a resource for native, generalist bees when native plants are gone, either due to habitat destruction or to the end of their bloom season. Declines in insect diversity worldwide, including declines in pollinators, have been attributed mainly to habitat loss, disruption, and fragmentation. The extinction and decline of pollinators, among them bees, could have serious consequences for plants that depend on them for successful fertilization as well as for biodiversity in general. Studies like this one are important in monitoring native bee abundance and biodiversity, as well as for creating a baseline record to which future bee studies can be compared.